As the American Civil War rages on, a black slave woman hides in a barn. Not knowing where to go next, she takes a moment to savour an apple, when a man bursts in. She is terrified as he grabs her, struggling to get away. He tries to calm her down, explains that he is a Quaker – and he’s going to help her get across the Mason-Dixon line, to a life of freedom. This is the opening scene of a worthy play about race in America; a history lesson that hits the notes you would expect in such a story. But this is not the play you are really watching. This is a literal history lesson, with two teachers re-enacting this moment for a modern history class. The facts of history can be dry, though. How does the education system effectively engage the student body with stories of the American Civil War? In this classroom, it’s by playing a game. The class/audience is divided into the Union Army and the Confederate Army – and already there’s a tension in the room. Who wants to be the ones cheering for the Confederate flag? Who of us, even as part of a theatrical experience, wants to be on the wrong side of history? This was the first moment I thought of how differently this show would play in New York, where it originated. Performers and creators Jennifer Kidwell & Scott R. Sheppard first presented Underground Railroad Game at Ars Nova in 2017. I imagine the reaction in those audiences would have been more palpable, more visceral. But here in Melbourne, we didn’t get away from feeling confronted. A classroom game about rescuing slaves is the bookend to this complicated play about race and power and gender politics, though. This concept is almost a misdirection, lulling the audience into a false sense of security. Yes, it’s easier to digest the politics of war and slavery as part of a game. But what about when the game premise slides away or falls apart completely? Outside the school, the teacher characters are on a date. Race relations takes on a whole new level of meaning, especially as the white man treats dating an African American woman as a kind of accomplishment, an achievement to be recognised. It’s the awkwardness of dating dialled up to eleven or twelve; it’s the social power dynamic of men and women further differentiated and complicated by race. This is the kind of show about race relations that I have never seen in Australia, because we don’t want to confront our history. This is bold, frank and transgressive satire that was deeply uncomfortable in many moments. Recreating a slave auction, even with the races reversed, is deeply confronting – especially as a kind of sexual humiliation creeps into the relationship. 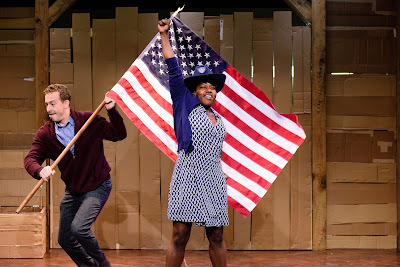 Underground Railroad Game is deceptively simple in its presentation but brutally honest in its treatment of a cruel American history that stains its present, even down to the classroom and the relationship between teachers there. The game is being played at the Malthouse Theatre until February 17, 2019.